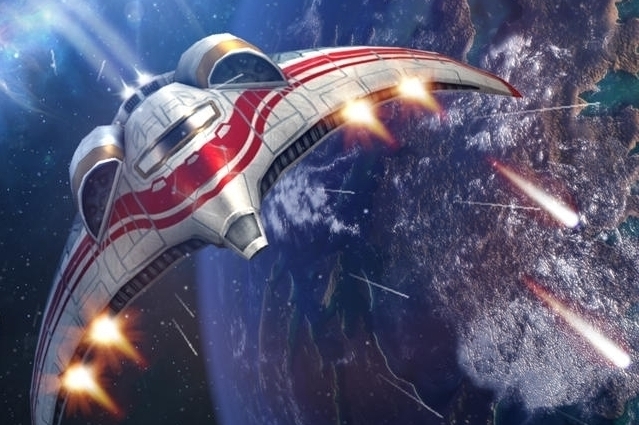 Fans of the Star Wars: Starfighter games will find a lot to like about Crescent Moon Games' Strike Wing: Raptor Rising. The game forgoes the usual space drama though, and instead thrusts you straight into galactic dogfights, where you shoot down enemy ships and unlock new missions. With each successful wave of enemies you take down, you'll earn credits, which you can use to pick up new ships. There's not a huge amount of difference between them, although some do provide a bit more firepower - missiles, faster lasers and the like. Considering the small 50MB download size, Strike Wing looks terrific, and there are plenty of ships and explosions to go around in that tiny package. There may not be much variety in the backgrounds, but with all the shots and explosions going on in your immediate vicinity, that's not really a big deal. The virtual joystick controls are quite responsive, allowing you to get a bead on enemies pretty easily. Unlocking secondary items like wingmen and missiles also helps turn the tide in your favor. Even better, there are three supplementary mission packs to download free of charge - a nice gesture on the developer's part. Out of the two control types, accelerometer is by far the weakest. It's not 100 percent accurate, and sometimes you'll drift past your target, leaving yourself open to attack. Our advice is to stick with the virtual touchscreen controls. While you don't necessarily need to put down money to unlock content, it's quite a grind earning a new ship. That means you'll be playing the same opening mission repeatedly. Finally, despite the presence of leaderboards, the game is singleplayer only - not having versus multiplayer feels like a missed opportunity. Although it's a bit repetitive when it comes to unlocking new stuff, Strike Wing: Raptor Rising is a fun ride for fans of space-shooters - particularly those who are looking to save a buck or too.